Hello. This description is quite clear, and coroborates other descriptions I have read. But there is a thing which is never clear, in any description I have read : is the main current intended to circulate via earth (and eventually return circuit by atmosphere), or the opposite ? This description insist on earth currents, but mention (without explanation) 30000 feets high receptor, as the atmosphere currents intended to be important too. Is this for the return circuit ? What is the role of atmosphere currents ? 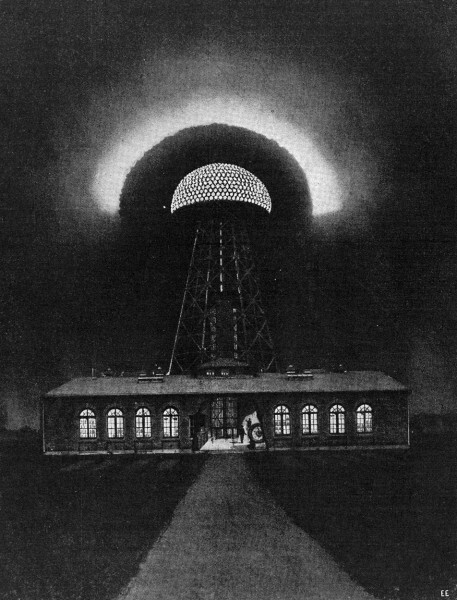 The real Wardenclyffe Tower had large underground structures to "grip" the earth, and I believe main currents should circulate via earth. What is the role of atmosphere current in this architecture ? Thanks for any answers. Hi JBC. Your question is very interesting and it is my objective to investigate with this website. 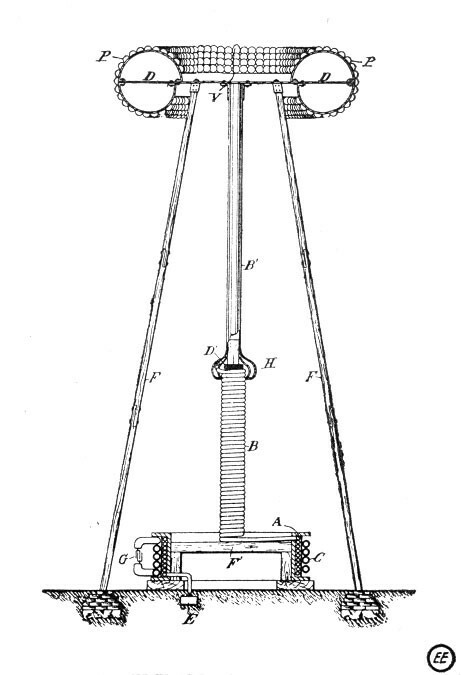 As you have read in the description of the Wardenclyffe tower, Tesla's intention was to transmit the 95% of the currents through the ground, I guess with a similar range of frequencies of Schumann resonances or telluric currents. He found that it would be very difficult to transmit electricity through the atmosphere and it maybe easier to interact with the natural discharges of lihghtning (and telluric currents caused by the same) by increasing the energy progressively as it happends with standing waves in a pool (see the collection of quotes in the Wardenclyffe section with the title "Principles & concepts of the World Wireless System"). An exemple: www.youtube.com/watch?v=NpEevfOU4Z8. 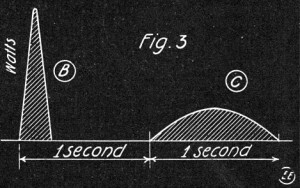 According to the modern science, to transmit wireless electricity through the air it would be necessary the microwave frequency but we also know that it wasn't Tesla's intention. Anyway he mentioned about "high frequency waves" to be used through the atmosphere before changing his plans. However, there is no evidence or possibility that he could produce microwaves in his times with the technology of that moment. I only could guess that if he had any intention to transmit energy through the atmosphere, the energy transmission trough the ground would be a priority to get the right conditions of charge in the atmosphere (probablly using harmonic frequencies). But I might be wrong. The atmosphere plan would be necessary anyway to transmit information like any radio system like speech, news, music and all that possibilities that he described. 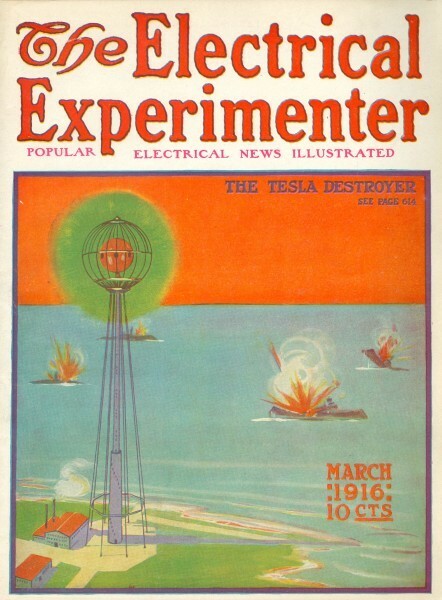 You can see a machine in Wardenclyffe which Tesla stated that was "to telephone around the world" maybe as HF radio where the ionosphere acts like a mirror to get more coverage. The Problem of Increasing Human Energy - by Nikola Tesla - Century Illustrated Magazine - June 1900: "When we raise the voice and hear an echo in reply, we know that the sound of the voice must have reached a distant wall, or boundary, and must have been reflected from the same". The modern theory says that telluric currents are a result from both natural causes (like lightning and schumann resonances) and human activity (obviously it was very low in Tesla's times), and the discrete currents interact in a complex pattern. The currents are extremely low frequency and travel over large areas at or near the surface of the Earth. I have the opinion that to prove Tesla's statements it would be necessaty to get more clues on how we could interact with those the telluric currents and not so much about the plan of transmitting wireless energy through the atmosphere, as most skeptics have pointed out. But for this reason the system should have influence around all the planet to get the right conditions (and not in a local coverage like in Colorado Springs lab). The problem is that I haven't found so much information on telluric currents and it seems that there are not so many investigations nowadays. If you know or if you find any interesting information about telluric currents or schumann resonance, please let me know about it.